About 700 British Army regulars, under Lieutenant Colonel Francis Smith, were given secret orders to capture and destroy military supplies that were reportedly stored by the Massachusetts militia at Concord. Through effective intelligence gathering, Patriot colonials had received word weeks before the expedition that their supplies might be at risk and had moved most of them to other locations. They also received details about British plans on the night before the battle and were able to rapidly notify the area militias of the enemy movement. The first shots were fired just as the sun was rising at Lexington. The militia were outnumbered and fell back, and the regulars proceeded on to Concord, where they searched for the supplies. At the North Bridge in Concord, approximately 500 militiamen fought and defeated three companies of the King’s troops. The outnumbered regulars fell back from the minutemen after a pitched battle in open territory. More militiamen arrived soon thereafter and inflicted heavy damage on the regulars as they marched back towards Boston. Upon returning to Lexington, Smith’s expedition was rescued by reinforcements under Brigadier General Hugh Percy. The combined force, now of about 1,700 men, marched back to Boston under heavy fire in a tactical withdrawal and eventually reached the safety of Charlestown. The accumulated militias blockaded the narrow land accesses to Charlestown and Boston, starting the Siege of Boston. The colonists had been forming militias of various sorts since the 17th century, at first primarily for defense against local native attacks. 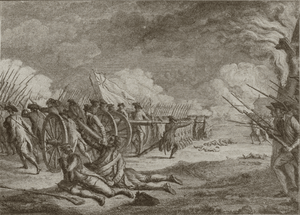 These forces were also mustered to action in the French and Indian War in the 1750s and 1760s. They were generally local militias, nominally under the jurisdiction of the provincial government. When the political situation began to deteriorate, in particular when Gage effectively dissolved the provincial government under the terms of the Massachusetts Government Act, these existing connections were employed by the colonists under the Massachusetts Provincial Congress for the purpose of resistance to the military threat from Britain. On April 14, 1775, Gage received instructions from Secretary of State William Legge, Earl of Dartmouth, to disarm the rebels, who were known to have hidden weapons in Concord, among other locations, and to imprison the rebellion’s leaders, especially Samuel Adams and John Hancock. Dartmouth gave Gage considerable discretion in his commands. On the morning of April 18, Gage ordered a mounted patrol of about 20 men under the command of Major Mitchell of the 5th Regiment of Foot into the surrounding country to intercept messengers who might be out on horseback. This patrol behaved differently from patrols sent out from Boston in the past, staying out after dark and asking travelers about the location of Adams and Hancock. This had the unintended effect of alarming many residents and increasing their preparedness. The Lexington militia in particular began to muster early that evening, hours before receiving any word from Boston. A well known story alleges that after nightfall one farmer, Josiah Nelson, mistook the British patrol for the colonists and asked them, “Have you heard anything about when the regulars are coming out?”, upon which he was slashed on his scalp with a sword. However, the story of this incident was not published until over a century later, which suggests that it may be little more than a family myth. Lieutenant Colonel Francis Smith received orders from Gage on the afternoon of April 18 with instructions that he was not to read them until his troops were underway. He was to proceed from Boston “with utmost expedition and secrecy to Concord, where you will seize and destroy… all Military stores… But you will take care that the soldiers do not plunder the inhabitants or hurt private property.” Gage used his discretion and did not issue written orders for the arrest of rebel leaders, as he feared doing so might spark an uprising. The rebellion’s ringleaders—with the exception of Paul Revere and Joseph Warren—had all left Boston by April 8. They had received word of Dartmouth’s secret instructions to General Gage from sources in London well before they reached Gage himself. Adams and Hancock had fled Boston to the home of one of Hancock’s relatives in Lexington where they thought they would be safe from the immediate threat of arrest. The Massachusetts militias had indeed been gathering a stock of weapons, powder, and supplies at Concord, as well as an even greater amount much further west in Worcester, but word reached the rebel leaders that British officers had been observed examining the roads to Concord. On April 8, Paul Revere rode to Concord to warn the inhabitants that the British appeared to be planning an expedition. The townspeople decided to remove the stores and distribute them among other towns nearby. The colonists were also aware of the upcoming mission on April 19, despite it having been hidden from all the British rank and file and even from all the officers on the mission. There is reasonable speculation, although not proven, that the confidential source of this intelligence was Margaret Gage, General Gage’s New Jersey-born wife, who had sympathies with the Colonial cause and a friendly relationship with Warren. Between 9 and 10 pm on the night of April 18, 1775, Joseph Warren told William Dawes and Paul Revere that the King’s troops were about to embark in boats from Boston bound for Cambridge and the road to Lexington and Concord. Warren’s intelligence suggested that the most likely objectives of the regulars’ movements later that night would be the capture of Adams and Hancock. They did not worry about the possibility of regulars marching to Concord, since the supplies at Concord were safe, but they did think their leaders in Lexington were unaware of the potential danger that night. Revere and Dawes were sent out to warn them and to alert colonial militias in nearby towns. 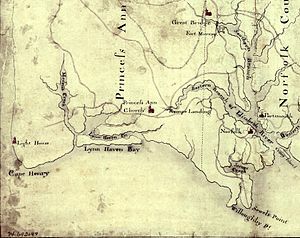 Dawes covered the southern land route by horseback across Boston Neck and over the Great Bridge to Lexington. Revere first gave instructions to send a signal to Charlestown and then he traveled the northern water route. He crossed the Charles River by rowboat, slipping past the British warship HMS Somerset at anchor. Crossings were banned at that hour, but Revere safely landed in Charlestown and rode to Lexington, avoiding a British patrol and later warning almost every house along the route. The Charlestown colonists dispatched additional riders to the north. After they arrived in Lexington, Revere, Dawes, Hancock, and Adams discussed the situation with the militia assembling there. They believed that the forces leaving the city were too large for the sole task of arresting two men and that Concord was the main target. The Lexington men dispatched riders to the surrounding towns, and Revere and Dawes continued along the road to Concord accompanied by Samuel Prescott. In Lincoln, they ran into the British patrol led by Major Mitchell. Revere was captured, Dawes was thrown from his horse, and only Prescott escaped to reach Concord. Additional riders were sent out from Concord. The ride of Revere, Dawes, and Prescott triggered a flexible system of “alarm and muster” that had been carefully developed months before, in reaction to the colonists’ impotent response to the Powder Alarm. This system was an improved version of an old network of widespread notification and fast deployment of local militia forces in times of emergency. The colonists had periodically used this system all the way back to the early years of Indian wars in the colony, before it fell into disuse in the French and Indian War. In addition to other express riders delivering messages, bells, drums, alarm guns, bonfires and a trumpet were used for rapid communication from town to town, notifying the rebels in dozens of eastern Massachusetts villages that they should muster their militias because the regulars in numbers greater than 500 were leaving Boston, with possible hostile intentions. This system was so effective that people in towns 25 miles (40 km) from Boston were aware of the army’s movements while they were still unloading boats in Cambridge. These early warnings played a crucial role in assembling a sufficient number of colonial militia to inflict heavy damage on the British regulars later in the day. Adams and Hancock were eventually moved to safety, first to what is now Burlington and later to Billerica. Around dusk, General Gage called a meeting of his senior officers at the Province House. He informed them that orders from Lord Dartmouth had arrived, ordering him to take action against the colonials. He also told them that the senior colonel of his regiments, Lieutenant Colonel Smith, would command, with Major John Pitcairn as his executive officer. The meeting adjourned around 8:30 pm, after which Lord Percy mingled with town folk on Boston Common. According to one account, the discussion among people there turned to the unusual movement of the British soldiers in the town. When Percy questioned one man further, the man replied, “Well, the regulars will miss their aim”. “What aim?” asked Percy. “Why, the cannon at Concord” was the reply. Upon hearing this, Percy quickly returned to Province House and relayed this information to General Gage. Stunned, Gage issued orders to prevent messengers from getting out of Boston, but these were too late to prevent Dawes and Revere from leaving. The British regulars, around 700 infantry, were drawn from 11 of Gage’s 13 occupying infantry regiments. For this expedition, Major John Pitcairn commanded ten elite light infantry companies, and Lieutenant Colonel Benjamin Bernard commanded 11 grenadier companies, under the overall command of Lieutenant Colonel Smith. Of the troops assigned to the expedition, 350 were from grenadier companies drawn from the 4th (King’s Own), 5th, 10th, 18th (Royal Irish), 23rd, 38th, 43rd, 47th, 52nd and 59th Regiments of Foot, and the 1st Battalion of His Majesty’s Marine Forces. Protecting the grenadier companies were about 320 light infantry from the 4th, 5th, 10th, 23rd, 38th, 43rd, 47th, 52nd and 59th Regiments, and the 1st Battalion of the Marines. Each company had its own lieutenant, but the majority of the captains commanding them were volunteers attached to them at the last minute, drawn from all of the regiments stationed in Boston. This lack of bond between commander and company would turn out to be problematic. At about 3 am, Colonel Smith sent Major Pitcairn ahead with six companies of light infantry under orders to quick march to Concord. At about 4 am Smith made the wise but belated decision to send a messenger back to Boston asking for reinforcements. Though often styled a battle, in reality the engagement at Lexington was a minor brush or skirmish. As the regulars’ advance guard under Pitcairn entered Lexington at sunrise on April 19, 1775, about 80 Lexington militiamen emerged from Buckman Tavern and stood in ranks on the village common watching them, and between 40 and 100 spectators watched from along the side of the road. Their leader was Captain John Parker, a veteran of the French and Indian War, who was suffering from tuberculosis and was at times difficult to hear. Of the militiamen who lined up, nine had the surname Harrington, seven Munroe (including the company’s orderly sergeant, William Munroe), four Parker, three Tidd, three Locke, and three Reed; fully one quarter of them were related to Captain Parker in some way. This group of militiamen was part of Lexington’s “training band”, a way of organizing local militias dating back to the Puritans, and not what was styled a minuteman company. After having waited most of the night with no sign of any British troops (and wondering if Paul Revere’s warning was true), at about 4:15 a.m., Parker got his confirmation. Thaddeus Bowman, the last scout that Parker had sent out, rode up at a gallop and told him that they were not only coming, but coming in force and they were close. Captain Parker was clearly aware that he was outmatched in the confrontation and was not prepared to sacrifice his men for no purpose. He knew that most of the colonists’ powder and military supplies at Concord had already been hidden. No war had been declared. (The Declaration of Independence would not even be written for another year). He also knew the British Army had gone on such expeditions before in Massachusetts, found nothing, and marched back to Boston. Rather than turn left towards Concord, Marine Lieutenant Jesse Adair, who was at the head of the advance guard, decided on his own to protect the flank of the troops by first turning right and then leading the companies down the common itself in a confused effort to surround and disarm the militia. These men ran towards the Lexington militia loudly crying “Huzzah!” to rouse themselves and to confuse the militia, as they formed a battle line on the common. Major Pitcairn arrived from the rear of the advance force and led his three companies to the left and halted them. The remaining companies under Colonel Smith lay further down the road toward Boston. A British officer (probably Pitcairn, but accounts are uncertain, as it may also have been Lieutenant William Sutherland) then rode forward, waving his sword, and called out for the assembled throng to disperse, and may also have ordered them to “lay down your arms, you damned rebels!” Captain Parker told his men instead to disperse and go home, but, because of the confusion, the yelling all around, and due to the raspiness of Parker’s tubercular voice, some did not hear him, some left very slowly, and none laid down their arms. Both Parker and Pitcairn ordered their men to hold fire, but a shot was fired from an unknown source. Some witnesses among the regulars reported the first shot was fired by a colonial onlooker from behind a hedge or around the corner of a tavern. Some observers reported a mounted British officer firing first. Both sides generally agreed that the initial shot did not come from the men on the ground immediately facing each other. Speculation arose later in Lexington that a man named Solomon Brown fired the first shot from inside the tavern or from behind a wall, but this has been discredited. Some witnesses (on each side) claimed that someone on the other side fired first; however, many more witnesses claimed to not know. Yet another theory is that the first shot was one fired by the British, that killed Asahel Porter, their prisoner who was running away (he had been told to walk away and he would be let go, though he panicked and began to run). Historian David Hackett Fischer has proposed that there may actually have been multiple near-simultaneous shots. Historian Mark Urban claims the British surged forward with bayonets ready in an undisciplined way, provoking a few scattered shots from the militia. In response the British troops, without orders, fired a devastating volley. This lack of discipline among the British troops had a key role in the escalation of violence. Witnesses at the scene described several intermittent shots fired from both sides before the lines of regulars began to fire volleys without receiving orders to do so. A few of the militiamen believed at first that the regulars were only firing powder with no ball, but when they realized the truth, few if any of the militia managed to load and return fire. The rest wisely ran for their lives. The regulars then charged forward with bayonets. Captain Parker’s cousin Jonas was run through. Eight Massachusetts men were killed and ten were wounded; only one British soldier of the 10th Foot wounded. The eight colonists killed were John Brown, Samuel Hadley, Caleb Harrington, Jonathon Harrington, Robert Munroe, Isaac Muzzey, Asahel Porter, and Jonas Parker. Jonathon Harrington, fatally wounded by a British musket ball, managed to crawl back to his home, and died on his own doorstep. One wounded man, Prince Estabrook, was a black slave who was serving in the militia. The companies under Pitcairn’s command got beyond their officers’ control in part because they were unaware of the actual purpose of the day’s mission. They fired in different directions and prepared to enter private homes. Colonel Smith, who was just arriving with the remainder of the regulars, heard the musket fire and rode forward from the grenadier column to see the action. He quickly found a drummer and ordered him to beat assembly. The grenadiers arrived shortly thereafter, and once order was restored the light infantry were permitted to fire a victory volley, after which the column was reformed and marched on toward Concord. The militiamen of Concord and Lincoln, in response to the raised alarm, had mustered in Concord. They received reports of firing at Lexington, and were not sure whether to wait until they could be reinforced by troops from towns nearby, or to stay and defend the town, or to move east and greet the British Army from superior terrain. A column of militia marched down the road toward Lexington to meet the British, traveling about 1.5 miles (2 km) until they met the approaching column of regulars. As the regulars numbered about 700 and the militia at this time only numbered about 250, the militia column turned around and marched back into Concord, preceding the regulars by a distance of about 500 yards (457 m). The militia retreated to a ridge overlooking the town and the command discussed what to do next. Caution prevailed, and Colonel James Barrett surrendered the town of Concord and led the men across the North Bridge to a hill about a mile north of town, where they could continue to watch the troop movements of the British and the activities in the center of town. This step proved fortuitous, as the ranks of the militia continued to grow as minuteman companies arriving from the western towns joined them there. When the troops arrived in the village of Concord, Smith divided them to carry out Gage’s orders. The 10th Regiment’s company of grenadiers secured South Bridge under Captain Mundy Pole, while seven companies of light infantry under Captain Parsons, numbering about 100, secured the North Bridge near Barrett’s force. Captain Parsons took four companies from the 5th, 23rd, 38th and 52nd Regiments up the road 2 miles (3.2 km) beyond the North Bridge to search Barrett’s Farm, where intelligence indicated supplies would be found. Two companies from the 4th and 10th were stationed to guard their return route, and one company from the 43rd remained guarding the bridge itself. These companies, which were under the relatively inexperienced command of Captain Walter Laurie, were aware that they were significantly outnumbered by the 400-plus militia men that were only a few hundred yards away. The concerned Captain Laurie sent a messenger to Smith requesting reinforcements. Using detailed information provided by Loyalist spies, the grenadier companies searched the small town for military supplies. When they arrived at Ephraim Jones’s tavern, by the jail on the South Bridge road, they found the door barred shut, and Jones refused them entry. According to reports provided by local Loyalists, Pitcairn knew cannon had been buried on the property. Jones was ordered at gunpoint to show where the guns were buried. These turned out to be three massive pieces, firing 24-pound shot, that were much too heavy to use defensively, but very effective against fortifications, with sufficient range to bombard the city of Boston from other parts of nearby mainland. The grenadiers smashed the trunnions of these three guns so they could not be mounted. They also burned some gun carriages found in the village meetinghouse, and when the fire spread to the meetinghouse itself, local resident Martha Moulton persuaded the soldiers to help in a bucket brigade to save the building. Nearly a hundred barrels of flour and salted food were thrown into the millpond, as were 550 pounds of musket balls. Of the damage done, only that done to the cannon was significant. All of the shot and much of the food was recovered after the British left. During the search, the regulars were generally scrupulous in their treatment of the locals, including paying for food and drink consumed. This excessive politeness was used to advantage by the locals, who were able to misdirect searches from several smaller caches of militia supplies. Barrett’s Farm had been an arsenal weeks before but few weapons remained now, and these were, according to family legend, quickly buried in furrows to look like a crop had been planted. The troops sent there did not find any supplies of consequence. Colonel Barrett’s troops, upon seeing smoke rising from the village square, and seeing only a few companies directly below them, decided to march back toward the town from their vantage point on Punkatasset Hill to a lower, closer flat hilltop about 300 yards (274 m) from the North Bridge. As the militia advanced, the two British companies from the 4th and 10th that held the position near the road retreated to the bridge and yielded the hill to Barrett’s men. Barrett told the men to load their weapons but not to fire unless fired upon, and then ordered them to advance. Laurie ordered the British companies guarding the bridge to retreat across it. One officer then tried to pull up the loose planks of the bridge to impede the colonial advance, but Major Buttrick began to yell at the regulars to stop harming the bridge. The Minutemen and militia advanced in column formation on the light infantry, keeping to the road, since it was surrounded by the spring floodwaters of the Concord River. Captain Laurie then made a poor tactical decision. Since his summons for help had not produced any results, he ordered his men to form positions for “street firing” behind the bridge in a column running perpendicular to the river. This formation was appropriate for sending a large volume of fire into a narrow alley between the buildings of a city, but not for an open path behind a bridge. Confusion reigned as regulars retreating over the bridge tried to form up in the street-firing position of the other troops. Lieutenant Sutherland, who was in the rear of the formation, saw Laurie’s mistake and ordered flankers to be sent out. But as he was from a company different from the men under his command, only three soldiers obeyed him. The remainder tried as best they could in the confusion to follow the orders of the superior officer. A shot rang out, and this time there is certainty from depositions taken from men on both sides afterwards that it came from the Army’s ranks. It was likely a warning shot fired by a panicked, exhausted British soldier from the 43rd, according to Laurie’s letter to his commander after the fight. Two other regulars then fired immediately after that, shots splashing in the river, and then the narrow group up front, possibly thinking the order to fire had been given, fired a ragged volley before Laurie could stop them. Two of the Acton Minutemen, Private Abner Hosmer and Captain Isaac Davis, who were at the head of the line marching to the bridge, were hit and killed instantly. Four more men were wounded, but the militia only halted when Major Buttrick yelled “Fire, for God’s sake, fellow soldiers, fire!” At this point the lines were separated by the Concord River and the bridge, and were only 50 yards (46 m) apart. 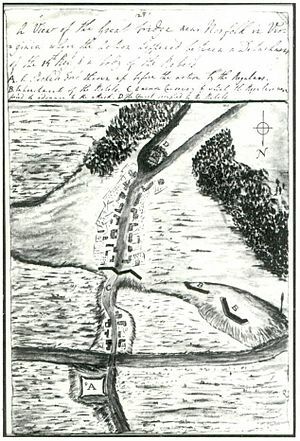 The few front rows of colonists, bound by the road, and blocked from forming a line of fire, managed to fire over each other’s heads and shoulders at the regulars massed across the bridge. Four of the eight British officers and sergeants, who were leading from the front of their troops, were wounded by the volley of musket fire. At least three privates (Thomas Smith, Patrick Gray and James Hall, all from the 4th) were killed or mortally wounded, and nine were wounded.